The Premier Kaiserhof Vienna is on a side street near the Belvedere Castle. Within 15 minutes of walking out the front door, guests will find themselves near either the Stadtpark Garden, St. Stephen’s Church, or the pedestrian shopping zone. The Western Premier Kaiserhof Vienna is 20 km from the airport. The nearest metro is the Karlsplatz, which also serves as a bus and tram stop. 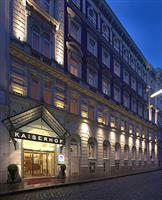 The Premier Hotel Kaiserhof Vienna has 74 rooms, decorated in a traditionally influenced modern style. Each room has individualized air conditioning, cable TV, broadband Internet access, a mini bar, telephone, built-in safes, en-suite bathroom, and hair dryer. Smoking and non-smoking rooms are available, separated by level. VCR’s and movies are available from the front desk. The Best Western Premier Hotel Kaiserhof Vienna is in a traditionally styled building with a well-appointed breakfast room and reception area. There are a number of guest entertainment facilities onsite, including a piano bar, new fitness center, sauna, steam-bath facility, and business center. Conference space is available, with optional catering service.